I purchase cruelty-free Tussah silk to add to my soap recipes. Cruelty-free means the silk fibers are collected only after the Silkworms have emerged from the cocoons. The steps below involve the use of sodium hydroxide (lye). 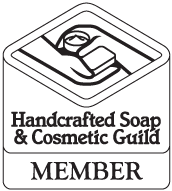 Remember to always wear gloves, eye protection, and protect your skin when making soap and dealing with lye. First, I take a small amount of silk (about a cotton ball in size for a 5 pound batch) and chop it up into small pieces. In the photos, I’m actually making 10 pounds of soap, so I’ve used about 2 large cotton balls of silk. After the silk has been chopped, I add it to the distilled water that’s required for my recipe. I like to let the silk soak in the water for a bit before adding the lye. It can take a bit of stirring and pushing with the spoon to get the silk down in the water. When I’m ready, I add the lye to the distilled water and silk mixture. You can see in the picture on the left (below) that the silk gets quite stringy when the lye is first added. As you stir, the silk will slowly dissolve. You’ll be left with a beige colored solution. When I add the lye solution to my melted oils, I always use a stainless steel strainer to catch any undissolved pieces of silk. And that’s how I use silk in my non-vegan soap recipes.